I found this recipe on Pinterest. It is from a blog by Mandi called vintagerevivals.com. She is not a food blogger, but has fallen in love with a sugar cookie made at a little bakery called Swig. Mandi has quite a life story including working through her husband's addiction and struggling to hold her family together. From my cursory read, her faith has played an important role in her life. Her story is interesting and I would encourage you to look at her DIY and decorating blog. 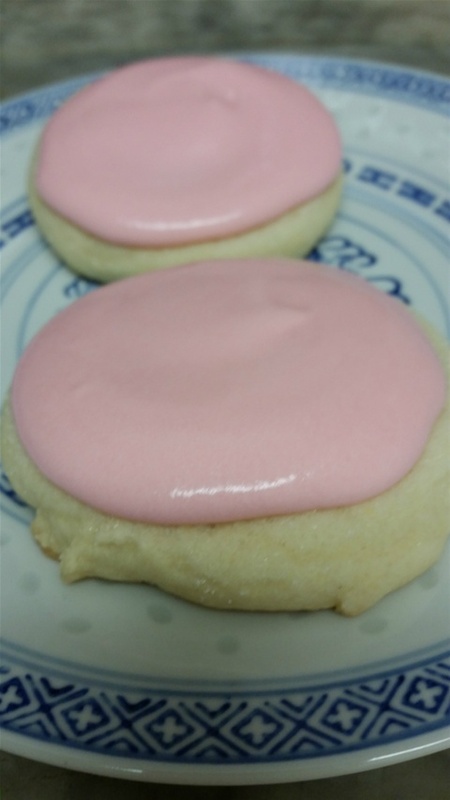 Mandi experimented with many sugar cookie recipes and came up with this one that tasted like her beloved Swig cookies. She asks on her blog that instead of giving out the recipe you refer people to her blog, but come on, seriously, she put it on Pinterest. I have made these cookies twice. The first time I frosted them (see the picture above). The sour cream frosting is easy and delicious, but personally I feel like it is unnecessary. The second time I made these I added lemon flavoring and they were delicious without any frosting! They are thick, moist if you don't overcook them, and can handle any flavoring you want to add to them. Almond would be delish. These cookies are best kept in the fridge and hold-up well to freezing. I'm feeding them to my moving crew for sure!! Cream together butter, vegetable oil, sugars, water and eggs. Combine the dry ingredients and slowely add to butter mixture. Mix until combined. The dough will be very dry. 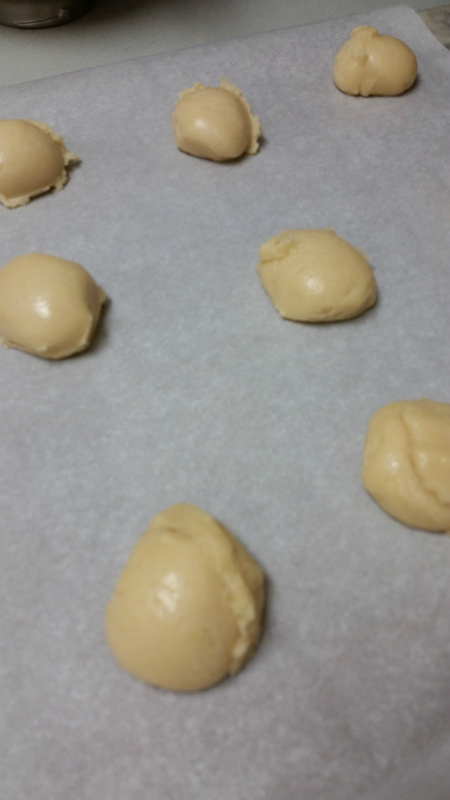 Use an ice cream scoop and scoop balls of dough onto a parchment-covered cookie sheet. Using the bottom of a large glass, flatten each cookie to about 1/2 inch thick after dipping it into a small bowl of granulated sugar mixed with a pinch of salt. Bake at 350 F for 8 to 10 minutes. They should be just slightly brown on the bottom. Move cookies to cooling rack and once they are completely cooled refrigerate them in an airtight container. Cream together butter and sour cream and salt. Slowly add powdered sugar. When it begins to get very thick add a splash of milk. Alternate sugar and milk until the frosting is the desired consistency. If you want it to be pink like the Swig cookie, add one drop of red food coloring and whip on high for 1 minute. 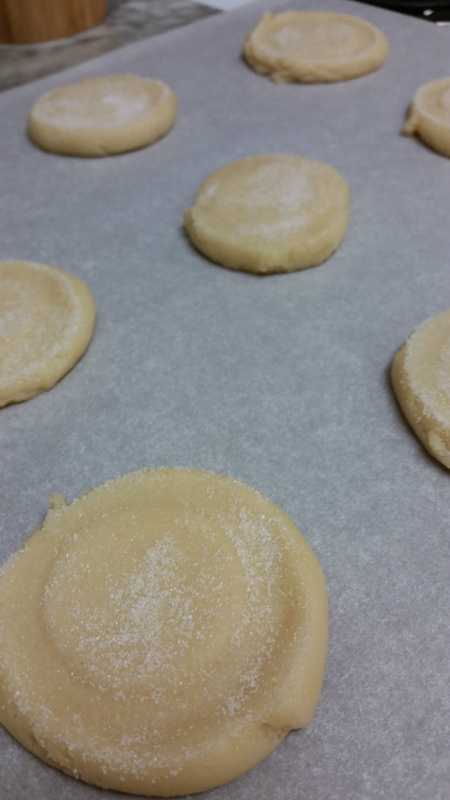 Mandi says that the "magic of a Swig Sugar Cookie is that the cookies are cold and the frosting is room temperature." Therefore, keep the cookies and frosting refrigerated and let the frosting come up to room temperature before using it. The cookie should be frosted just before serving. This dough is really thick. 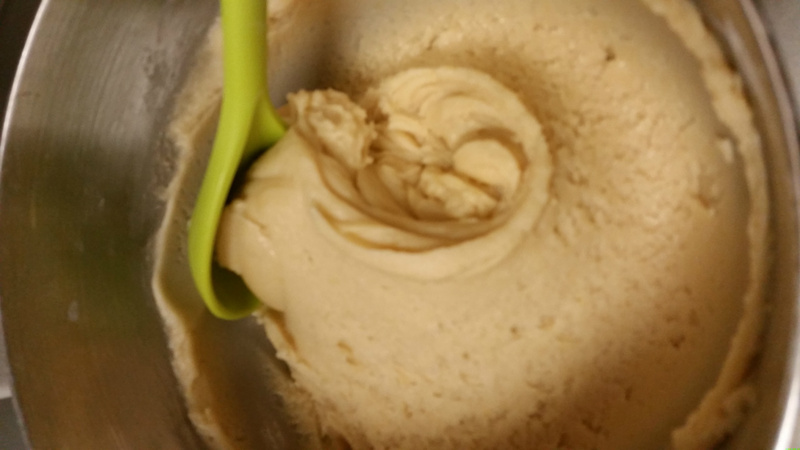 An ice cream scoop works well! Flatten cookies to 1/2 inch. Try not to eat all of these right out of the oven! 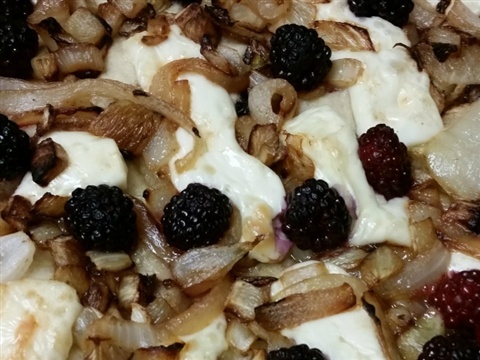 Coming up next: berry and brie pizza for an adult party. 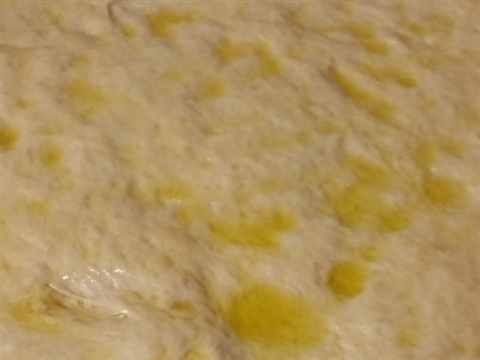 Start with a quick yeast pizza dough topped with olive oil. This pizza will be topped out of the oven with an arugula salad. Pizza with a salad on top! 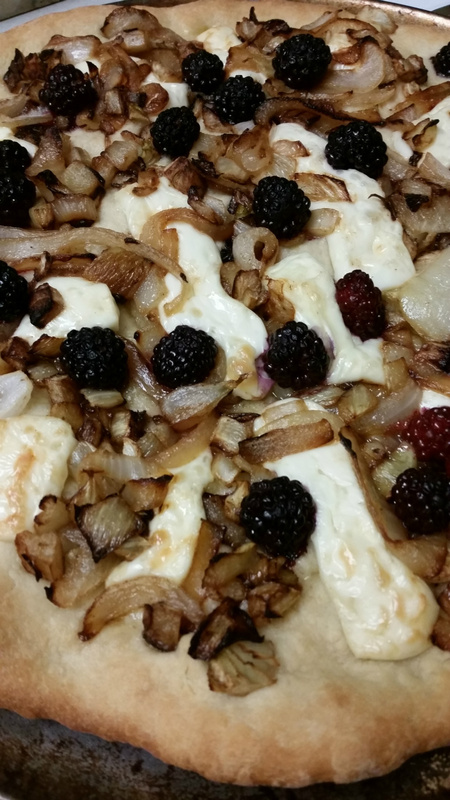 Whether or not you can pick your own blackberries as I did, or even if they are out of season, this brie pizza, or as the recipe suggests, small pizzas or "pizzettas," is delicious and could be topped with any sort of berry you can get your hands on. I especially like the fennel browned with the onion topping, and just the right amount of salt and pepper to taste makes the perfect base for the fresh arugula topping. 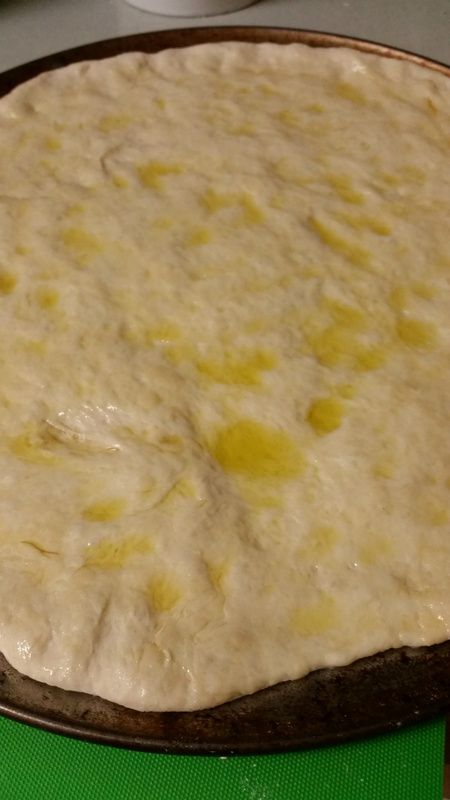 As mentioned in the pictures above, I found a great quick yeast pizza dough. This dough does not need to rise and holds up to all of the semi-wet toppings well. It does tend to get a bit hard on the second day, but it is so good that hopefully you won't have much left. In a medium bowl, dissolve yeast and sugar in warm water. Let stand until creamy, about 10 minutes. Stir in flour, salt and oil. Beat until smooth. Let rest for 5 minutes. 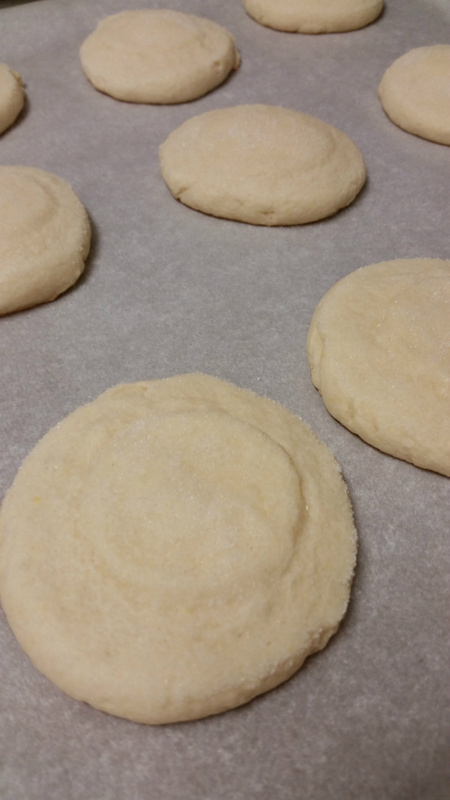 Turn dough out onto a lightly floured surface and pat or roll into a round. Transfer crust to a lightly greased pizza pan dusted with cornmeal. Top and bake. Preheat oven to 425 degrees. Melt butter in a large skillet over medium-high heat. 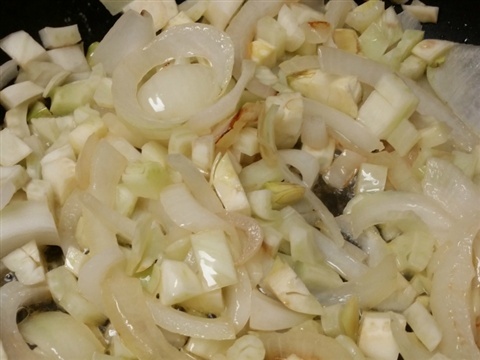 Add onion and fennel and cook, stirring often until golden brown. Shape pizza dough into 6 inch rounds and place on greased, cornmealed pans. The above dough recipe will make 4-5 of these. Brush each piece with EVOO. 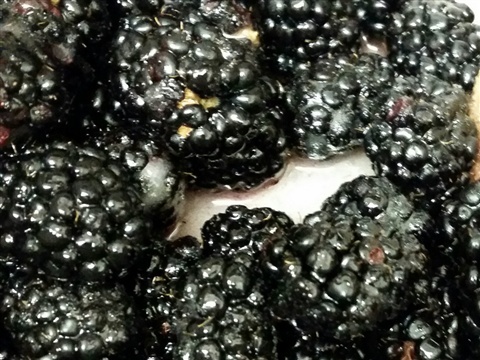 Top rounds with cheese slices, blackberries, and onion mixture. Bake for 15 minutes or until golden brown at the bottom. 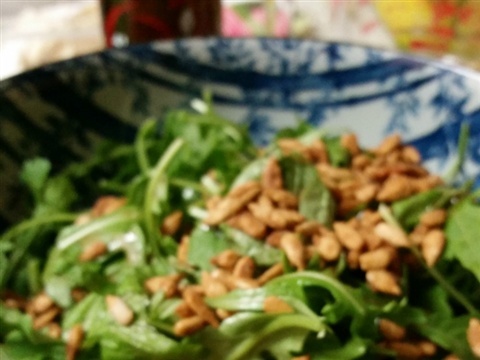 Toss together arugula, nuts, basil, and balsamic vinegar with a touch of olive oil. Add salt and pepper to taste. 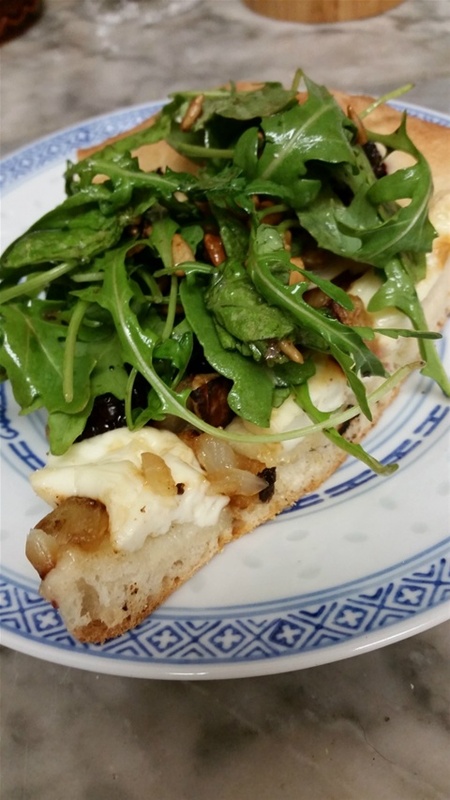 Sprinkle baked pizzettas with arugula mixture just before serving. 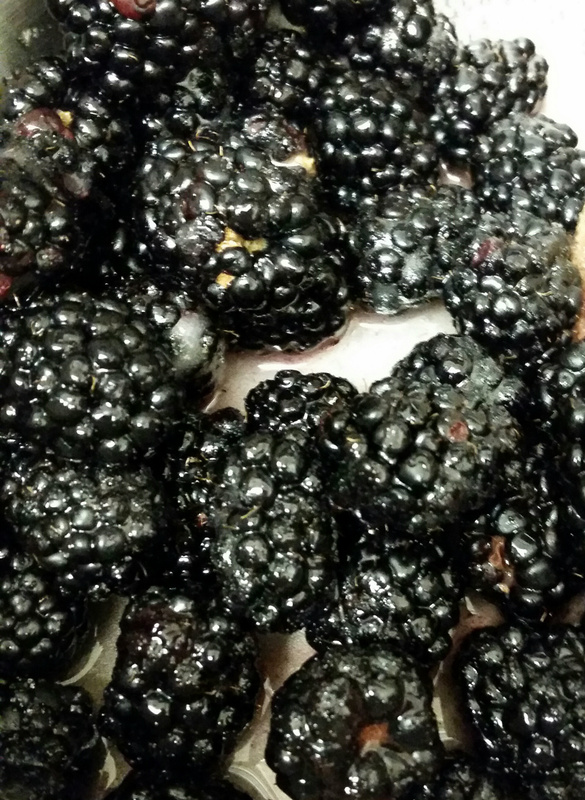 Blackberries are called for but any berries will work. I chopped the fennel like celery. 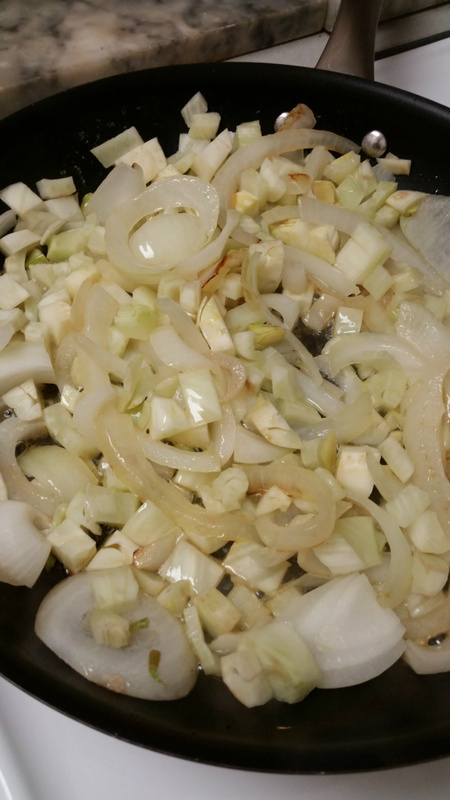 It adds a beautiful sweetness to the browned onion. 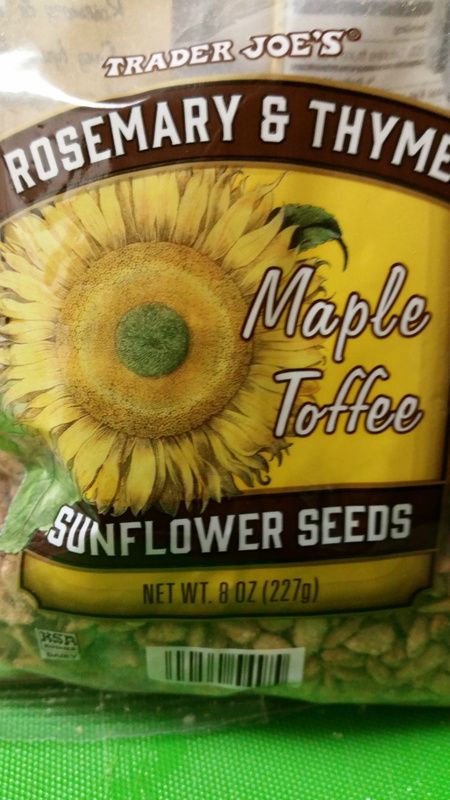 I love these Maple Toffee sunflower seeds from Trader Joes. 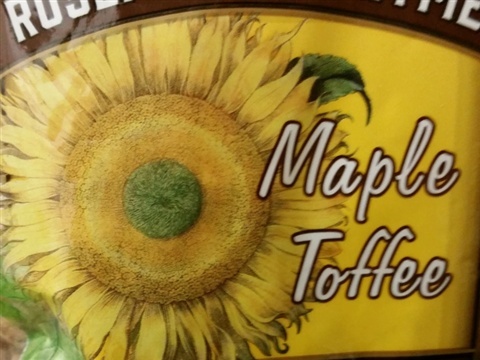 They have just the right amount of sweetness and are brilliant when tossed in a salad. 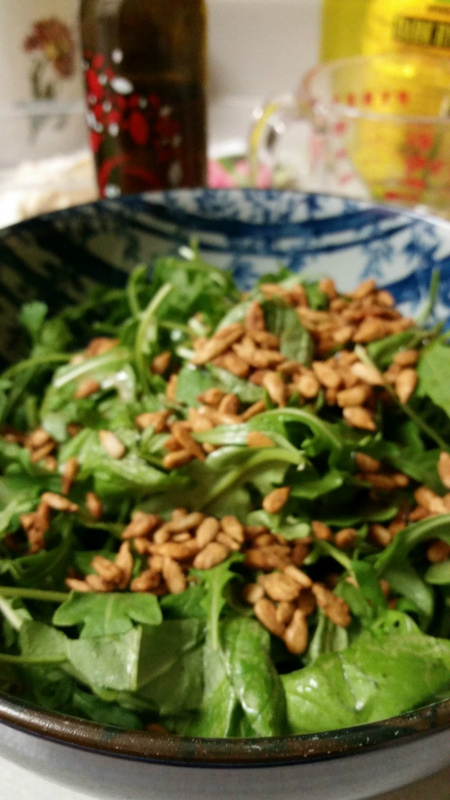 I used them in the arugula mixture instead of almonds. I also used lemon balsamic vinegar for the dressing.